If you turn on your garden water tap up to 30 liters of water a minute that could flow out. 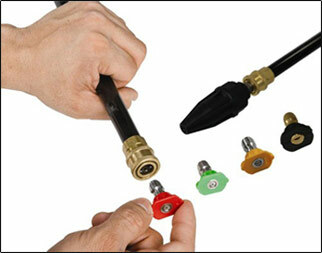 Add a spray gun to a garden hose and this reduces the flow to 19 liters a minute. This is all to do with the water pressure; the hose and the spray gun stem the water flow. The pressure increases from 10 to about 40 PSI (pounds per square inch) which gives the direction, speed and flow of the water from the water faucet and greatly reduces the amount of water used. This kind of water pressure is great for watering the lawn or your vegetable patch but isn’t quite powerful enough to clean everything; the water is simply not powerful enough to blast away dirt and debris. A specially made pressure washer creates enough ultra powerful pressure via a petrol powered engine or an electric motor to increase the water pressure to an amazing 1000-4000 PSI. This is serious water pressure which blasts away tough dirt and grime. Before you decide which pressure washer would benefit you, let’s learn these two important terms. PSI means Pounds per Square Inch of Pressure. The stronger the PSI the easier it is to blast dirt, grime and stains and breaking down the chemical compound to leave the surface clean. Water flow is measured in GPM which is Gallons Per Minute. The larger the GPM, the larger the surface area a pressure washer can clean at once. So now you have an understanding of a couple of key terms, its time to see which category of pressure washer you fall into. 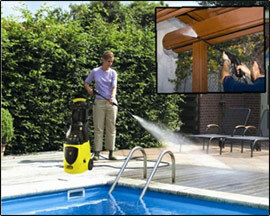 A consumer pressure washer is perfect for around the home. Great for cleaning down the driveway or decking and giving your bike, caravan, boat, car or garage a good clean without getting your hands dirty. Models on the market today are very affordable and great for a DIY or outdoor enthusiast. Give the Ute a wash or your mountain bike a hose down after a big ride with the minimum of fuss. A consumer pressure washer handles every day stains, dirt and grime and the engines for these models are designed to handle basic dirt, grime and household debris only. Prosumer is a hybrid word for models which are in between a Consumer and Professional category. They bridge the gap between consumer and professional so you get a more powerful pressure washer without investing in an expensive professional model. Most of the Prosumer range of pressure washers come equipped with either a professional pump and a consumer engine, or a professional engine and a consumer pump. These are ideal for those who have multiple cars or vehicles, are in the professional sport and have many motorbikes for example or have a large home or estate to keep in a clean condition. A professional pressure washer is one to invest in if you mean business or have one! These models are designed to be tough, hardwearing, long lasting and withstand many more hours of use than a consumer or prosumer model. Designed and built to be used every day for many hours with high pressure and extra professional features. If you use a consumer or prosumer pressure washer in a professional or industrial capacity it will burn out quickly, lose pressure and break down. Look for a professional high powered pressure washer which has a professional or industrial engine along with a pump of the same power and design. You are a homeowner and want to keep your walls, fences, driveways and facades clean. If you have any kind of vehicle to maintain and clean such as a boat, caravan, car, bike or Ute. Electric power washers are perfect for cleaning small surface areas like cars, boats and BBQ grills. An electric pressure washer cleans everyday dirt and grime effectively but does not work through large surface areas quickly. 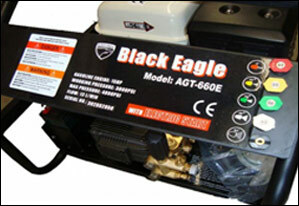 Electric pressure washers to have a big advantage over petrol powered unit. They require minimal maintenance and tend to run much quieter. They also tend to be affordable and portable. Petrol pressure washers do have some great advantages over its electric counterpart. The smallest petrol pressure washer is more likely to be more powerful than the largest electric power washer on the market. If the price is important, you need to look around online for the cheapest range of petrol pressure washers since they are the same price as the most expensive electric pressure washer. Petrol power washers are also more efficient and tend to use less water. It's great to keep those utility bills down and conserve water. You have large decking areas, exterior walls and large estates. You are a self employed Tradie or businessman and need extra power to clean your tools, Ute and workshop. You need to clean industrial or farming equipment on hobby farms or small holdings. Prosumer pressure washers are the best purchase if you need a little extra power but don't want to spend huge amounts on a professional unit. A prosumer pressure washer will come with professional pumps and valves and are specifically designed to tackle tougher tasks and they are also much faster than a consumer pressure washers. A prosumer pressure washer is a perfect choice for those who are out and about every weekend for sports and thrill seekers who thrive on an adrenaline wash. They are also perfect for DIY professionals and self employed businesses who need to keep equipment and areas clean with the minimum amount of time and fuss. Prosumer electric pressure washers tend to be more powerful and more reliable than consumer washer counterparts. You can take on larger surface areas, perfect for decks or the side of your home exterior in much less time. Electric pressure washers are also a green tool as they don’t emit harmful emissions, making them safe to use in covered areas and near animals and livestock. Prosumer petrol pressure washers are perfect when you need a tougher clean. They have more than twice the cleaning power compared to an electric washer, making them a perfect choice if you are time poor or need a really effective clean. You need to clean multiple types of agricultural equipment. You have a business which needs to be kept clean such as a restaurant, mechanics or abattoir. You have an industrial unit, large home or hanger to clean and maintain. Professional electric pressure washers come in all sorts of shapes with all sorts of features, pressures and budget brackets. You can choose from handheld units, cold water units, hot water units and even wall-mounted units. Also, with professional pressure washers, you can use them indoors, which is important in restaurant kitchens, mechanic workshops and places such as meat-packing facilities. With the hot water option, you can sanitise and keep really clean and up to WHS standards. 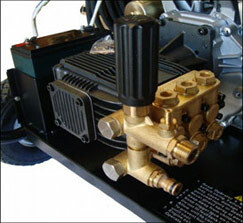 Professional petrol pressure washers come in three main types: cold water, hot water and belt-driven. 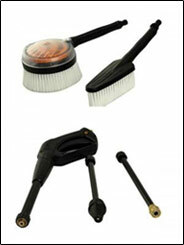 Perfect for cleaning different areas and equipment when you need versatility and effective cleaning. They are built to handle heavy use and to be used daily. The parts are built to last. If you are looking for the best of the best then you need to choose a professional vehicle mounted pressure washer. You can mount them in the bed of your Ute or choose a trailer mounted unit, perfect for the farm, mobile businesses and large homes. The quality of the parts and pressure washer performance will mean a bigger dent in your wallet. But the larger investment will pay for itself in no time with its long-lasting parts; efficient cleaning and time saving, powerful pressure and vehicle mount features. Whatever your budget and whatever you’re cleaning need there is a pressure washer out there, which will serve you just right. Take a look online now and get into the pressure washer revolution.